It’s officially Fall and you know what that means… Bring on the Pumpkin treats! Can I just say it really is amazing (and a bit insane) how pumpkin and pumpkin spice flavor can be found in almost everything! Now, don’t get me wrong, I love pumpkin spice flavor but, I just don’t think I need to have it in everything. Have you seen these Pumpkin Spice Flavored Candy Corn? I’m totally cool with the traditional flavor of candy corn so I really don’t see the need for it being spruced or spiced up with additional flavoring. If anyone has tried them though please let me know how they taste in the comment section below… LOL! There are a few pumpkin flavored items I couldn’t resist trying though… Chobani Flip Yogurt, M&M’s and Pepperidge Farm Milano Cookies. All of which were quite tasty in my book. I also purchased some Pumpkin Spice Morsels from Nestle that I can’t wait to bake into cookies. 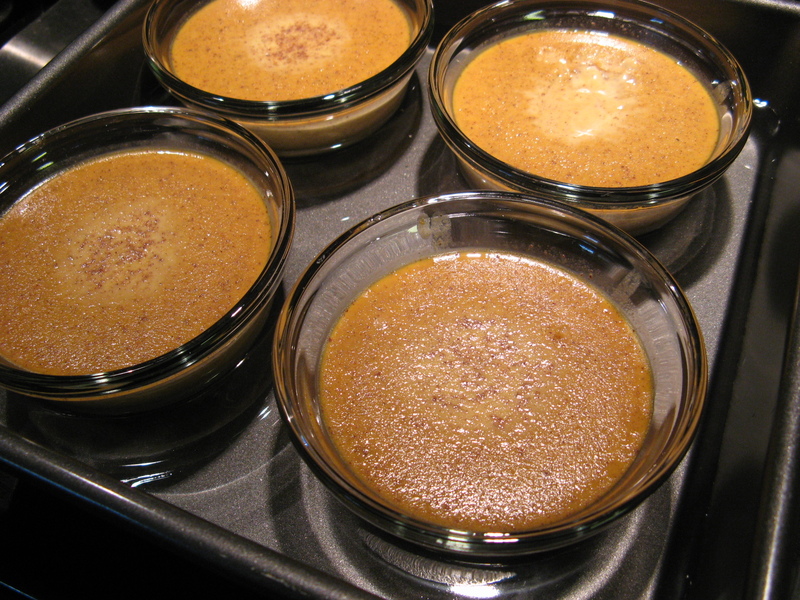 Which leads me to my first pumpkin baked treat of the season… Pumpkin Custards. 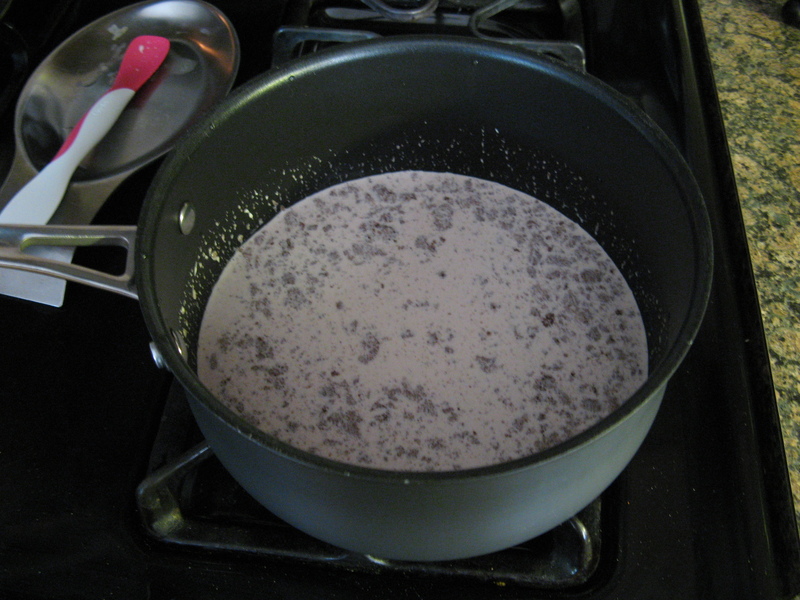 To begin to I whisked together heavy cream along with cinnamon, allspice, ginger and nutmeg in a medium saucepan and heated it over medium-low heat and warmed the mixture until it began to bubble along the edges and steam. I then removed it from the heat and let it stand for 15 minutes. 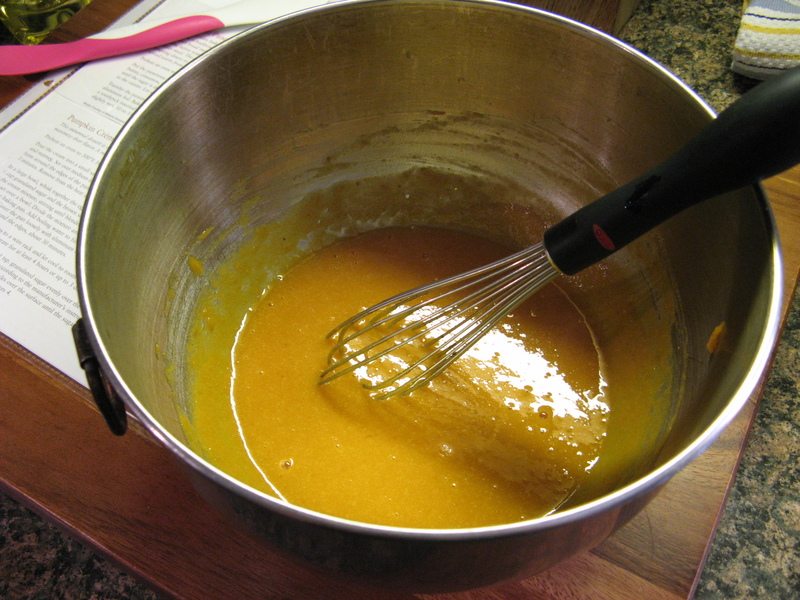 While the cream mixture was cooling, in a large bowl I blended together egg yolks, vanilla extract, salt, pumpkin puree, granulated sugar and light brown sugar until it was smooth. 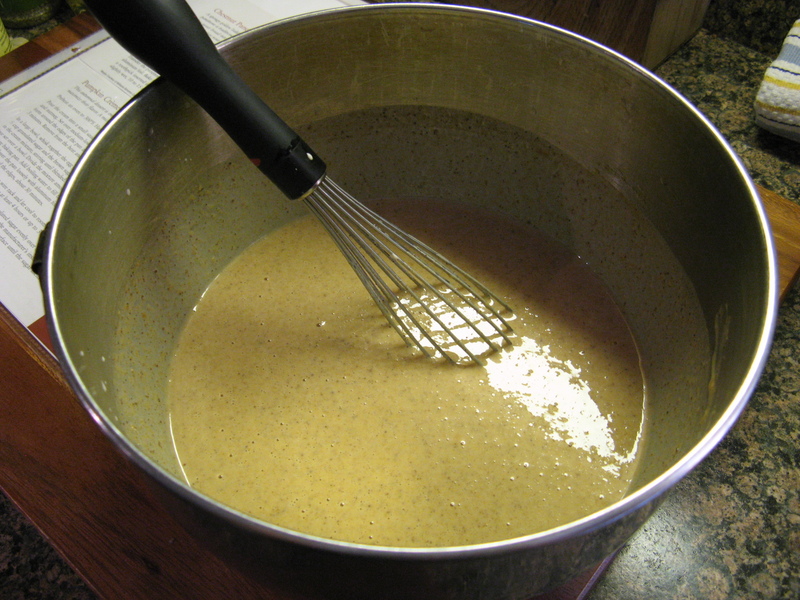 Slowly I poured the cream mixture into the egg mixture, and stirred it until it was blended. You don’t want to put the cream into the eggs too quickly because you don’t want to end up with scrambled eggs! After straining the mixture through a fine mesh sieve I divided it among 4 ramekins which I placed in a baking pan and filled the pan with boiling water about halfway up the sides of the ramekins. 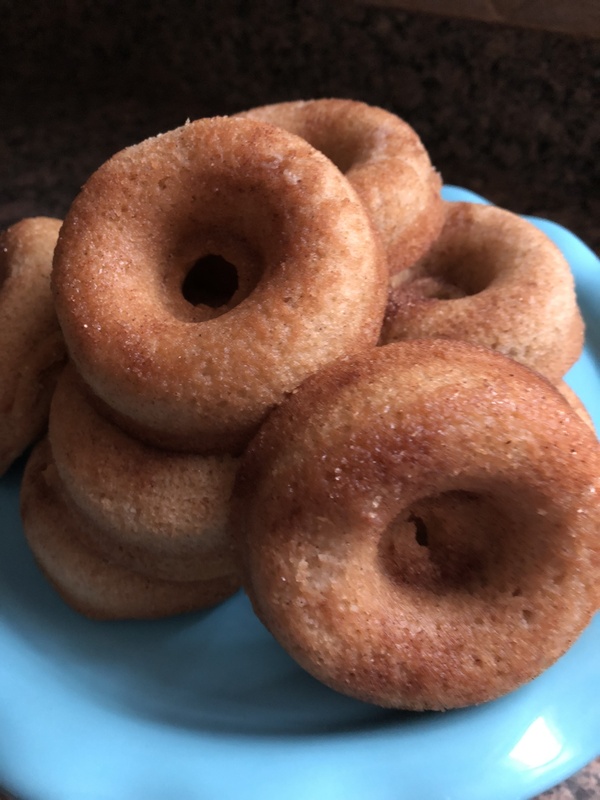 After covering the pan with aluminum foil I baked it in a preheated 300 F oven for about a half hour – until the edges of the custards began to set. Once I removed them from the oven I transferred the custards to a wire rack to cool to room temperature. I had a bit of a mishap in transferring them. My wire rack somehow slipped and I ended up losing two of the custards. Thankfully the ramekins didn’t break, but, I was left with a quite a mess to clean-up since the custards hadn’t completely set and ended up splattering everywhere. 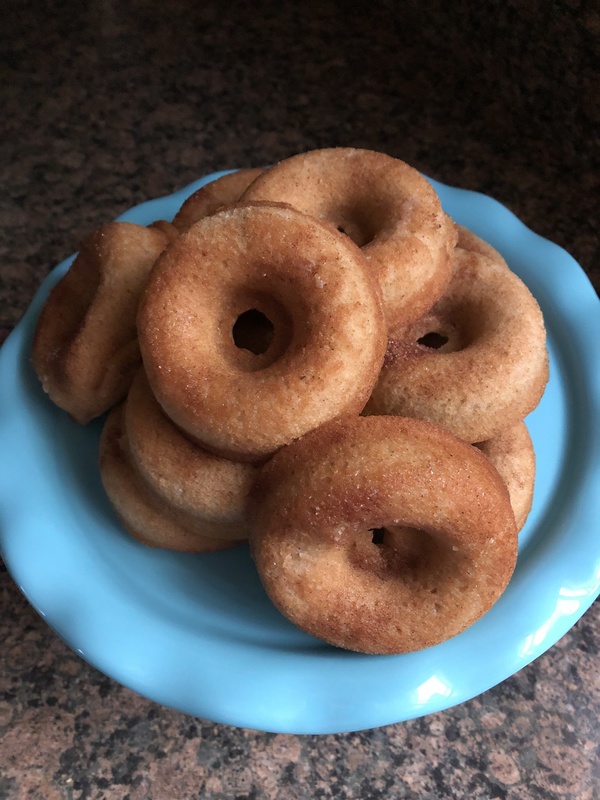 After they had cooled I covered them and placed them in the refrigerator and later that evening it was time to enjoy my first pumpkin treat – well, first pumpkin treat that I personally baked – for the season with a topping of whipped cream! Preheat the oven to 300 F and boil a pot of water. 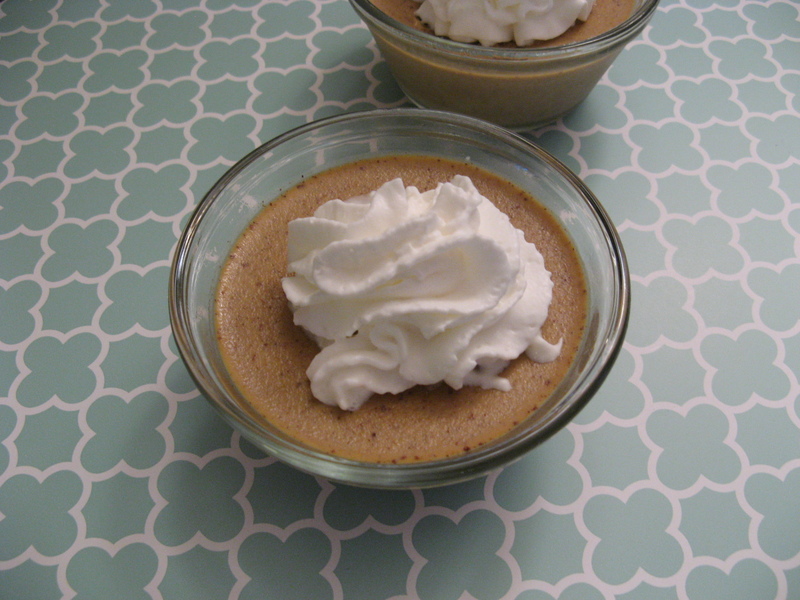 Pour the cream into a small saucepan and whisk in the cinnamon, allspice, ginger and nutmeg. Heat over medium-low heat and the warm the mixture until bubbles form around the edges and steam begins to rise. Remove from the heat and let stand for 15 minutes. In a large bowl blend together the egg yolks, vanilla extract, salt, pumpkin puree, granulated sugar and light brown sugar. Slowly pour in the cream mixture, stirring until blended. Pour the mixture through a fine-mesh sieve set over a large bowl. Divide the mixture among four 8 fluid-ounce ramekins and place them in a baking dish. Pour the hot water into the pan about halfway up the sides of the ramekins. Cover the pan loosely with aluminum foil and bake for about 30 minutes, until the custards are just set around the edges. Transfer the ramekins to a wire rack to cool to room temperature, then cover with plastic wrap and refrigerate for at least 4 hours or up to 3 days.